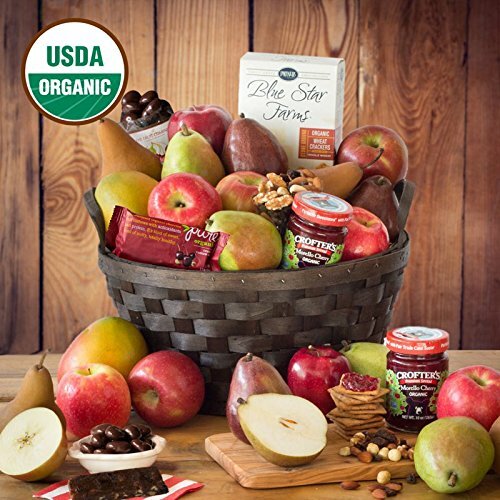 The Organic Fruit Jubilee Gift Basket is the perfect choice for anyone who loves healthy eating. Picked at the peak of freshness, our luscious organic pears and crisp organic apples are paired with a delicious organic trail mix and sesame chunky cherry bar and other mouth-watering treats. This Gift Basket Includes: 1 Organic Cherry Cashew Bar - 1.7 oz., 1- 10 oz Organic Cherry Spread, 1- 4 oz 1 Organic Dark Chocolate Almonds - 4 oz.